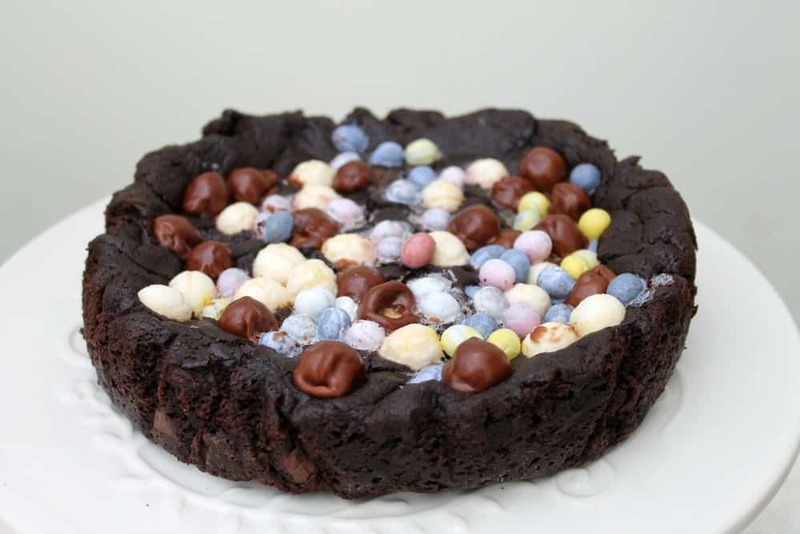 Perfect for Easter – Slow Cooker Chocolate Overload Cookie Cake! Have you tried a cookie cake before? 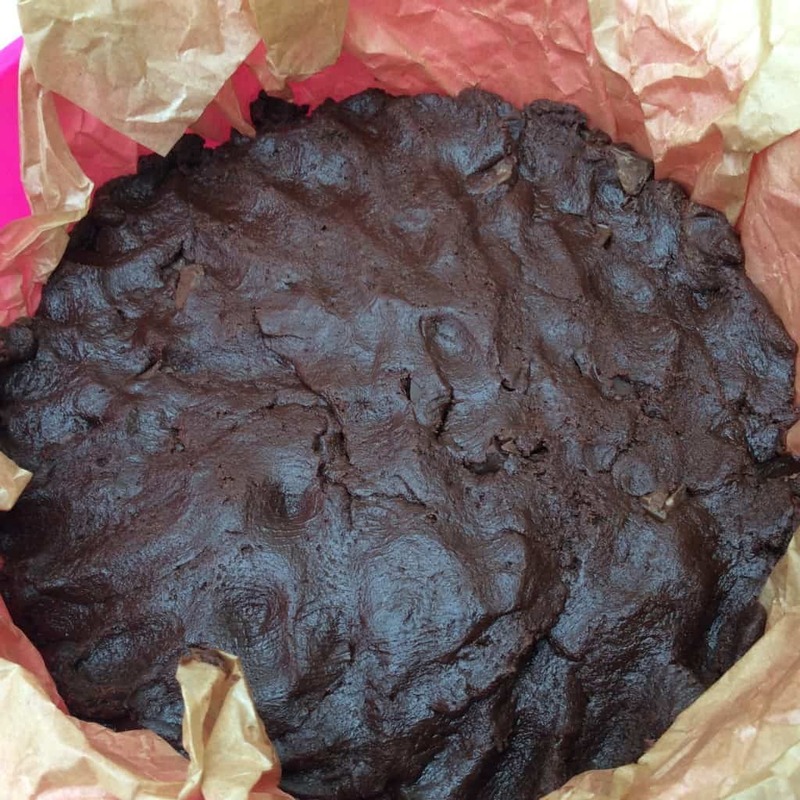 A huge, thick cookie baked in one pan, they are very naughty indeed, a delicious treat. In America they are sometimes called skillet cookies. A bit like the huge cookies you can get from Millie’s too. I’ve made this one using a double chocolate cookie dough, and then topped it with more chocolates. 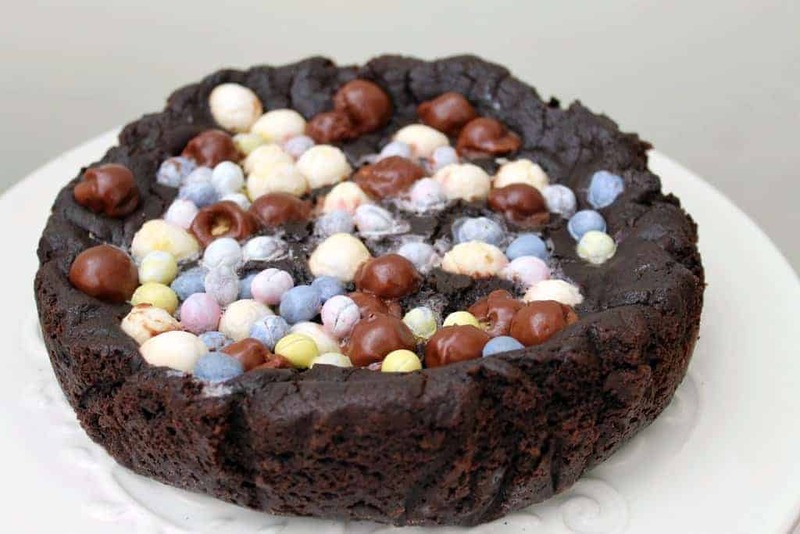 I’ve used Maltesers, some leftover Milkybar mini eggs and a few micro eggs. 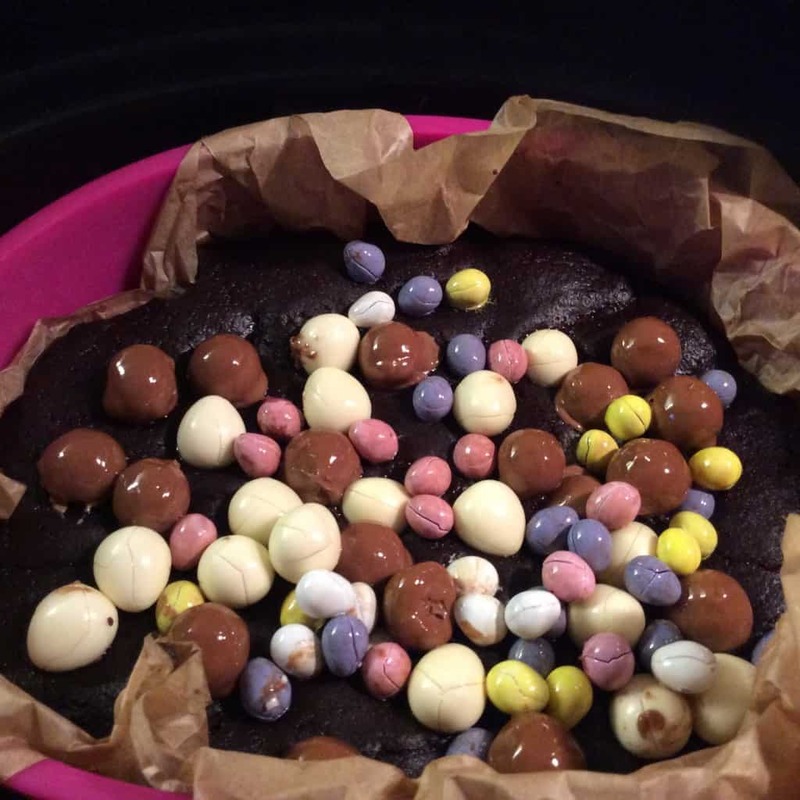 Do you think it has enough chocolate in it?? You can bake these in a normal cake tin in the oven, or in a frying pan/skillet on the hob as well of course. 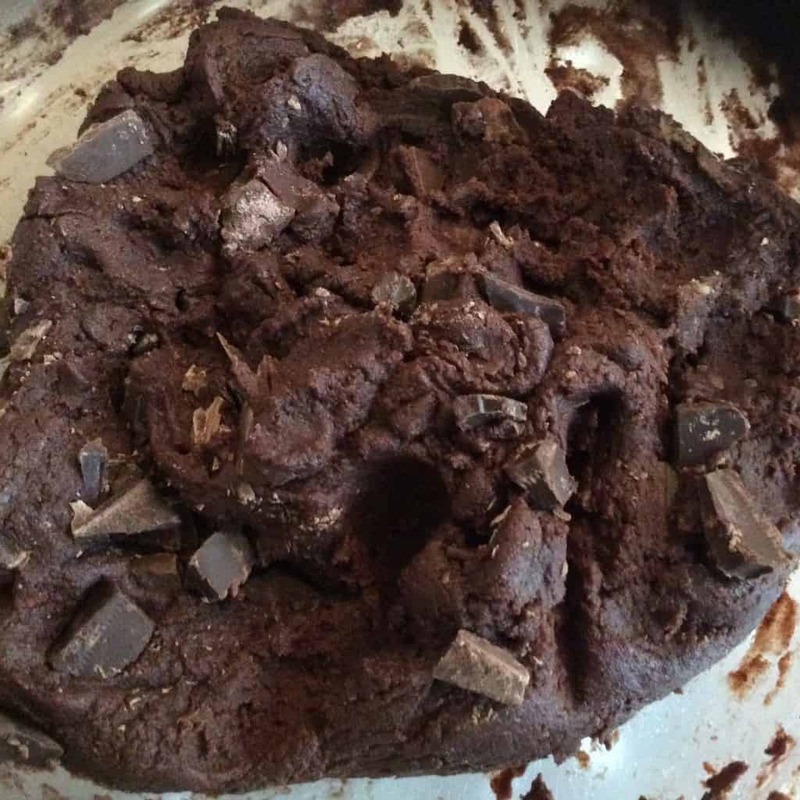 I made this one in the slow cooker – then the chocolates can be added on top before the cookie becomes firm, without them sinking in or completely melting. A delicious treat perfect for using up chocolates or candy left over from Easter, Halloween or Christmas! Cream the sugar into the butter until soft and fluffy. Beat in the eggs and add the vanilla bean paste. Sift the flour, cocoa powder and baking powder in a separate bowl. Fold the flour mixture in bit by bit. I found at the end that I needed to use my hands to combine it together fully and form a dough. Add the chopped chocolate to the dough and mix well. Line a large round silicone baking pan with baking paper and spoon the dough in. Press the dough down with your fingers to fill the pan. Place the pan in your slow cooker (I used a large 5.7 litre slow cooker that fits my silicone pan) and add two small jugfuls of water around the silicone pan. Place the lid on the slow cooker, with a tea towel tucked in under the lid to stop the condensation dripping on the cookie cake. Turn the slow cooker on low and cook for 2 hours. After the two hours, add the chocolates on top. The top should not yet be firm, so you can press the chocolates into the dough. Cook for a further 30 minutes on high. Check that the dough has risen and seem firm around the edges. It won't feel firm in the middle but it will firm up as it cools, as cookies do. Remove the silicone pan from the slow cooker and leave the cookie cake to cool completely. If needed (or if you just fancy it) you can add more chocolate on top before serving! What Easter treats will you be baking? 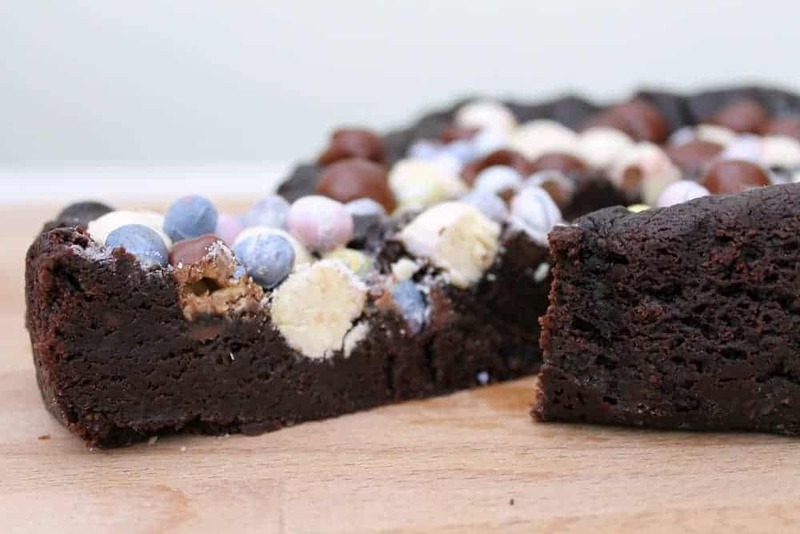 Check out my other Easter recipes here. 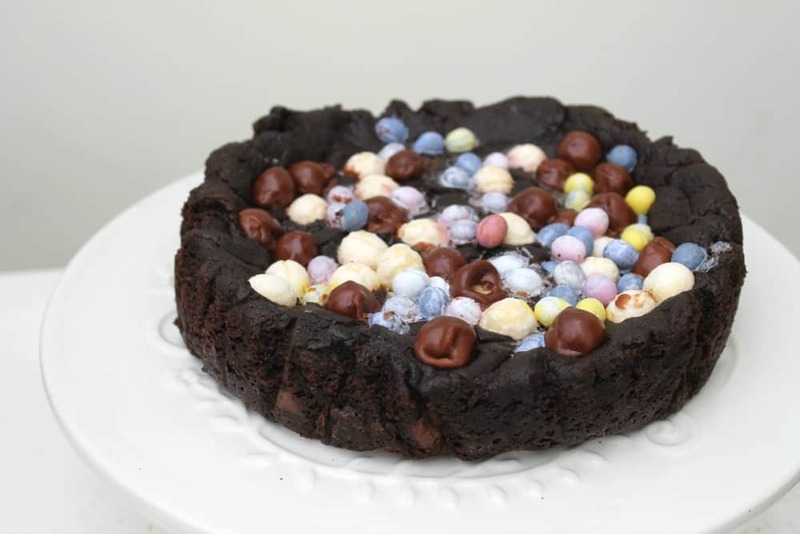 Linking up with Dom from Belleau Kitchen’s link up Simply Eggcellent, the theme for April is chocolate. 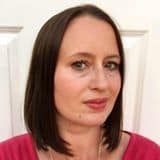 I’m also linking up with Tea Time Treats with Karen from Lavender and Lovage and Janie from The Hedgecombers, where this month’s theme is also chocolate. 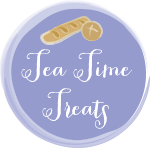 April’s Tea Time Treats Chocolate Recipe Round-Up! Thanks Karen, thanks to you for hosting! Wowsers! Small slices, I think!! 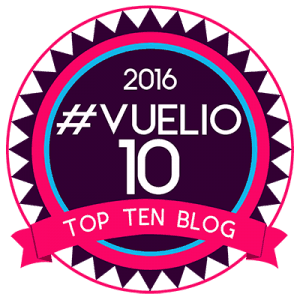 Another Slow Cooker triumph, Lucy! Hope you have a lovely Easter weekend. This looks AMAZING!! Love the chocolate overload 😉 I’ve made ‘skillet cookies’ before but never tried them in the slow cooker, great idea! Frying pan cookies doesn’t have the same ring to it does it! Thanks, I must try one the normal way next. Wow, I’ve never heard of this before- looks really interesting! Thanks Laura, it smells great!